High quality shoulder holster with one holster and one clip pouch. Designed for both left and right handed use. High quality shoulder holster with two holsters. Designed for both left and right handed use. High quality shoulder holster with one holster and one clip pouch. Designed for both left and right handed use. High quality shoulder holster with two holsters. Designed for both left and right handed use. High quality shoulder holster with one holster and one clip pouch. Designed for both left and right handed use. High quality shoulder holster with one holster and one clip pouch. Designed for both left and right handed use. High quality shoulder holster with two holsters. Designed for both left and right handed use. Cost effective black ankle holster for concealed carry. Designed for small pistols. Elastic waist band ambidextrous holster for concealed carry. Large size. Fits waist sizes from 40" to 48". Elastic waist band ambidextrous holster for concealed carry. Medium size. Fits waist sizes from 30" to 38". This Ambidextrous holster made from lightweight durable material. Fits most medium to large frame pistols and revolvers inside the pants for concealment. This Ambidextrous holster made from lightweight durable material. Fits most small to medium frame pistols inside the pants for concealment. Deluxe ambidextrous belt holster designed for left or right handed use. Works with any belt up to 2 1/2 inches wide. Deluxe ambidextrous belt holster with spring steel removable belt clip . Fits M1911, Beretta, Taurus, S&W and More. Nice ambidextrous vehicle seat holster. Nice ambidextrous vehicle seat holster. High quality and fully adjustable horizontal shoulder holster. Modular design allows for both left and right handed use. High quality and fully adjustable horizontal shoulder holster. Modular design allows for both left and right handed use. High quality and fully adjustable horizontal shoulder holster. Modular design allows for both left and right handed use. High quality and fully adjustable horizontal shoulder holster. Modular design allows for both left and right handed use. High quality and fully adjustable horizontal shoulder holster. Modular design allows for both left and right handed use. High quality and fully adjustable horizontal shoulder holster. Modular design allows for both left and right handed use. Wrap around universal design fits virtually any handgun or pistol. Attaches to any Velcro surface. Wrap around universal design fits virtually any handgun or pistol. Attaches to any Velcro surface. Wrap around universal design fits virtually any handgun or pistol. Attaches to any Velcro surface. Universal pistol holster. Attaches to any Velcro surface on vests, leg rigs, pouches and gear bags. Holster to replace the clip pouch of TG235 Shoulder Holster. Fits most popular auto pistols and revolvers. Holster to replace the clip pouch of TG235 Shoulder Holster. Fits most popular auto pistols and revolvers. High quality and fully adjustable vertical shoulder holster. Modular design allows for both left and right handed use. High quality and fully adjustable vertical shoulder holster. Modular design allows for both left and right handed use. High quality and fully adjustable vertical shoulder holster. Modular design allows for both left and right handed use. High quality and fully adjustable vertical shoulder holster. Modular design allows for both left and right handed use. High quality and fully adjustable vertical shoulder holster. Modular design allows for both left and right handed use. High quality and fully adjustable vertical shoulder holster. Modular design allows for both left and right handed use. Replacement holster for TG255 Shoulder Holster. Fits most popular auto pistols and revolvers. Ambidextrous belt holster with spring steel removable belt clip and mag pouch. Fits .22 - .25 Cal. small Autos and small .380's. Ambidextrous belt holster with spring steel removable belt clip and mag pouch. Fits Kel-Tec, Sigma, Kimber 380, AMT .45, Kahr Mini 9/40. Ambidextrous belt holster with spring steel removable belt clip and mag pouch. Fits standard 380's. Ambidextrous belt holster with spring steel removable belt clip and mag pouch. Fits Compact 9mm pistols, such as FireStar. Ambidextrous belt holster with spring steel removable belt clip and mag pouch. Fits Glock 19, 23 and Baby/Pocket Glock 26, 27. Ambidextrous belt holster with spring steel removable belt clip and mag pouch. Fits Glock 19, 23, and Baby Glocks with rails. Ambidextrous belt holster with spring steel removable belt clip and mag pouch. Fits full size Glocks, Rugers, S&W, Sigs Autos with 4" barrels. Ambidextrous belt holster with spring steel removable belt clip and mag pouch. Fits full size H&K, such as Hipoint 40, Hipoint 45 and HK-USP. Ambidextrous belt holster with spring steel removable belt clip and mag pouch. Fits full size Autos with under barrel laser sites and flashlights. Ambidextrous belt holster with spring steel removable belt clip and mag pouch. Fits full size Glocks, Rugers, S&W, Sigs Autos (4" bbls) with rails. Ambidextrous belt holster with spring steel removable belt clip and mag pouch. Fits Colt and Springfield 1911 large frame Auto, Llama 45, Para Ordnance P14, Smith & Wesson and Taurus. Ambidextrous belt holster with spring steel removable belt clip and mag pouch. Fits Beretta 92 / 8000 / 8010 and Taurus 92 / 99 with rails. Ambidextrous belt holster with spring steel removable belt clip and mag pouch. Fits Beretta 92 / 8000 / 8010 and Taurus 92 / 99. Ambidextrous belt holster with spring steel removable belt clip and mag pouch. Fits large frame Autos with Bull Barrels up to 6" such as Ruger MarkII, FN Five Seven, SigArms Trailside, Browning Buckmark. Ambidextrous belt holster with spring steel removable belt clip. Fits 2" Snub Revolvers. Ambidextrous belt holster with spring steel removable belt clip. Fits Revolvers with 3" Barrels. Ambidextrous belt holster with spring steel removable belt clip. Fits Revolvers with 4" barrels. Ambidextrous belt holster with spring steel removable belt clip. Fits Revolvers with 6" Barrels and Half Lugs. Ambidextrous belt holster with spring steel removable belt clip. Fits Revolvers with 6" Barrels and Full Lugs. Ambidextrous inside the Pants Holster. Fits .22 - .25 Cal. small Autos and small .380's. Ambidextrous inside the Pants Holster. Fits 2" Snub Revolvers. Ambidextrous inside the Pants Holster. Fits Kel-Tec, Sigma, Kimber 380, AMT .45, Kahr Mini 9/40. Ambidextrous inside the Pants Holster. Fits Revolvers with 3" Barrels. Ambidextrous inside the Pants Holster. Fits standard 380's. Ambidextrous inside the Pants Holster. Fits Compact 9mm pistols, such as FireStar. Ambidextrous inside the Pants Holster. Fits Glock 19, 23 and Baby/Pocket Glock 26, 27. Ambidextrous inside the Pants Holster. Fits full size Glocks, Rugers, S&W, Sigs Autos with 4" barrels. Ambidextrous inside the Pants Holster. Fits Colt and Springfield 1911 large frame Auto, Llama 45, Para Ordnance P14, Smith & Wesson and Taurus. Ambidextrous belt holster with spring steel removable belt clip. Fits Revolvers with 4" barrels. Ambidextrous belt holster with spring steel removable belt clip. Fits Beretta 92 / 8000 / 8010 and Taurus 92 / 99. Deluxe fully lined ankle holster for concealed carry. Fits .22 - .25 Cal. small Autos and small .380's. Deluxe fully lined ankle holster for concealed carry. Fits 2" Snub Revolvers. Deluxe fully lined ankle holster for concealed carry. Fits Kel-Tec, Sigma, Kimber 380, AMT .45, Kahr Mini 9/40. Deluxe fully lined ankle holster for concealed carry. Fits standard 380's, such as Walther PPK, PPK/S, Sig P230, Makarov 380, Bersa 380, Colt 380, Beretta 380 and Star 380. Deluxe fully lined ankle holster for concealed carry. Fits Glock 19, 23 and Baby/Pocket Glock 26, 27. Deluxe ambidextrous shoulder holster with double pouches. Modular design allows for both left and right handed use. Fits .22 - .25 Cal. small Autos and small .380's. Deluxe ambidextrous shoulder holster with double pouches. Modular design allows for both left and right handed use. Fits 2" Snub Revolvers. Deluxe ambidextrous shoulder holster with double pouches. Modular design allows for both left and right handed use. Fits Kel-Tec, Sigma, Kimber 380, AMT .45, Kahr Mini 9/40. Deluxe ambidextrous shoulder holster with double pouches. Modular design allows for both left and right handed use. Fits Revolvers with 3" Barrels. 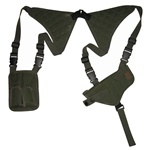 Deluxe ambidextrous shoulder holster with double pouches. Modular design allows for both left and right handed use. Fits standard 380's. Deluxe ambidextrous shoulder holster with double pouches. Modular design allows for both left and right handed use. Fits Compact 9mm pistols, such as FireStar.